This example from 26 August 2018 shows even more clearly a view through the clouds. Corrected Reflectance (True Color) from the Suomi NPP Visible Infrared Imaging Radiometer Suite (VIIRS), and the Brightness Temperature (Band I5, Day). Data from 26 August 2018. Now you understand what you are looking at, here are the all the brightness temperature images from 1 May 2018 to 26 August 2018 in which I could clearly identify iceberg A68a. The date is in the top right hand corner. You can see at between 7-12 July 2018 the weather conditions and ocean currents conspire to swing the trillion tonnes of the giant iceberg A68 in an anticlockwise direction. 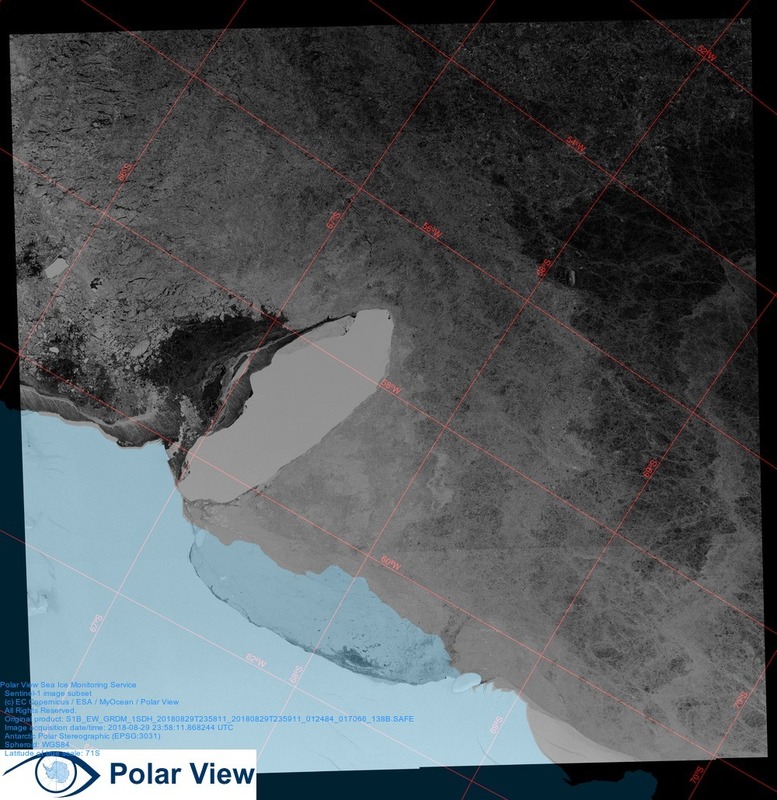 Sentinel-1 SAR satellite imagery from 29 August 2018 shows that to the north of the iceberg the wind is pushing the sea ice northwards faster than the iceberg is rotating. 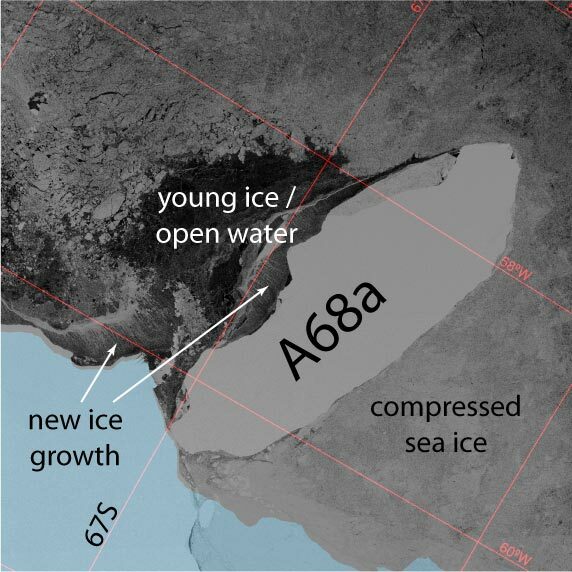 This has created an area of open water where there is intense sea ice generation happening right now. In the high resolution imagery you can clearly see large frazil ice slicks developing in this open water region. 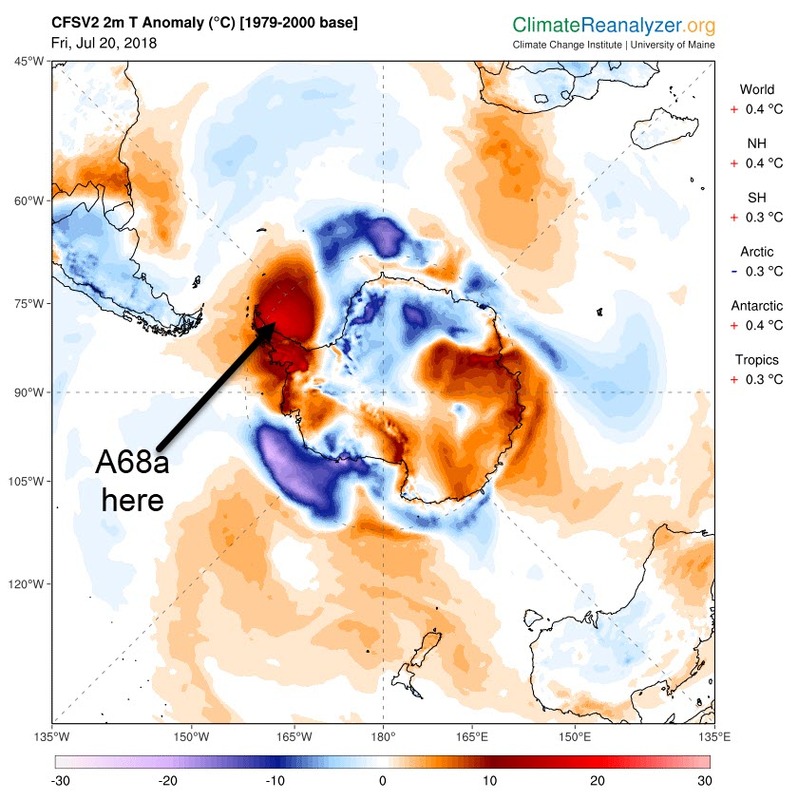 My guess is that A68a will continue rotating as it is now around that western point, until what is currently the northern edge collides with the Larsen C ice front. It has a spectacular amount of momentum and it's not going to stopped easily. I should think we will see some interesting collisions with the ice shelf in the next few months. What happened in July 2018 to start the drift? This should be another blog post! Larsen C has an Automatic Weather Station (AWS14, Larsen C North) operated by the Utrecht University Institute for Marine and Atmospheric Research. This is the data for 2018, and the horizontal axis shows day of year. Data from Automatic Weather Station 14 (67°01' S, 61°30' W, ~50 m a.s.l. Argos id:29157) operated by the Institute for Marine and Atmospheric Research. The highlighted region is where A68a starts to rotate anticlockwise. Just before A68a starts to rotate the wind speed drops to what appears to be the calmest period of 2018 up until then. Air Temperatures fell below -40°C - their lowest values of the year, before a few days later rising above 0°C. I have looked at the weather maps - but I am no meteorologist. I will come back to that data in the future. What I do know is it takes a lot of energy to get a trillion tonnes of ice moving. The temperature anomaly 20 July 2018 from the 1979-2000 mean. From ClimateReanalyzer.org. 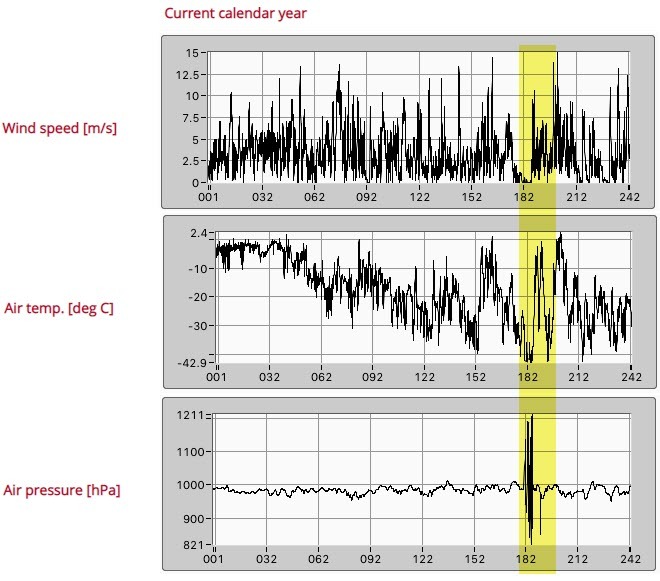 It was almost 20 °C warmer than the mean over the Weddell Sea and Larsen Ice shelf – and this is what we see in the weather data from AWS14 above. At the same time London, UK was coping a very significant heatwave, this area had some extreme temperatures. There is actually an emperor penguin colony in that region - I wonder how this affected them? I am going to continue to track A68a.